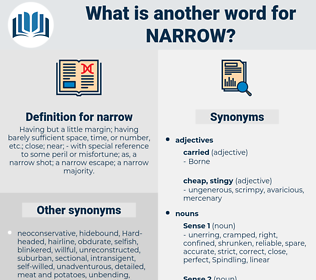 What is another word for narrow? Having but a little margin; having barely sufficient space, time, or number, etc. ; close; near; - with special reference to some peril or misfortune; as, a narrow shot; a narrow escape; a narrow majority. closer, closest, slender, tiny, strict, low, strong, little, scarce, constrained, constrictive, stringent, intimate, petty, scant, slight, finite, egotistical, bigoted, selfish, weak, diminished, strictly, modest, egoistic, restrained, one-sided, constraining, congested, illiberal, specific, miserly, shallow, minor, meagre, self-serving, simplistic, rigorous, minimal. closing, diminish, constrain, curtail, downsize, Bridging, confine, constrict, circumscribe, restrain, delimit, curb, fill, delineate, eliminate, Eliminating, refine. restrictive, parochial, small, cramped, blinkered, reductionist, slim, short-sighted, shortsighted, reductive, small-minded, circumscribed, myopic, rigid. unlimited, broad-minded, unconfined, liberal, open, broad, imprecise, free, poor, giving, thick, loose, spendthrift, fat, tolerant, generous, inexact, indefinite, accepting, strong, away, far, unfixed, unrestricted, wasting. unprejudiced, radical, impartial, fair, progressive, unbiased. voluminous, unreserved, inexhaustible, nonpartisan, undefined, expanded, enlarged, inestimable, unqualified, handsome, thickset, indeterminate, respectable, extreme, hulking, incalculable, squat, king-size, sizable, escalated, whacking, jumbo, bumper, goodly, stumpy, grandiose, endless, stocky, Dimensionless, substantial, major, super, oversize, largish, bottomless, hefty, freethinking, nebulous, vague, Widish, objective, epic, cosmopolitan, general, whole, plenitudinous, Thickish, careless. release, intensify, broaden, expand, complicate, let go, increase. The cry was raised in one of the narrow streets, 'Runaway horse! It depends upon what one thinks of, one's own narrow escape or the other man, or the way of the world. NRA, nearer, nauru, nero, NRO, noria, newari, nowhere, NARA, nary, nunnery, namur, no more, niner, namer, naira, norway, nmr, near, nonhairy, nehru, New Year, ne'er.